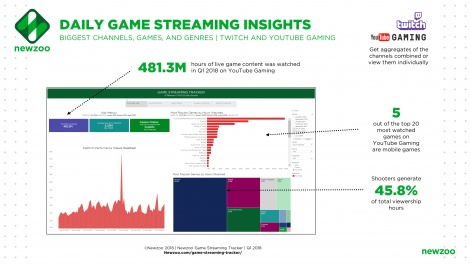 Market intelligence platform Newzoo has launched its Game Streaming Tracker in to early access. 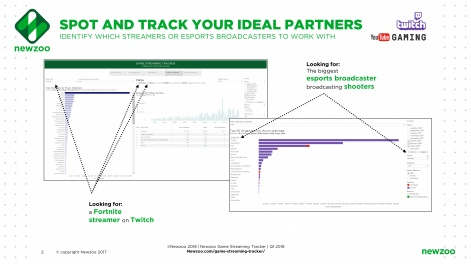 The tracker will compile live data from Twitch and YouTube Gaming, allowing users to find the titles and influencers best suited to their own campaigns. It'll provide instant insight in to a number of areas, including number of hours watched, how much a title has been broadcast, or average number of viewers per stream. Games and channels will be tagged and tracked by their publisher or genre, while esports will be categorised differently. The tracker will use machine-learning algorithms to spot the difference between a casual or personal stream and a esports one. Tracking games by geographical location will also be an option with the resource. The data will update every 15 minutes. The new tracker will also help companies strategically filter through the waves of influencers and brands to find ones that are the most appropriate to work with. It'll also help creators analyse and aid their community strategy by providing insight in to how popular certain titles are on their channel, and how viewership is affected by content release or events. "The role of gaming video content in the overall gaming experience has grown rapidly in the last couple of years. Game publishers need to involve video content and streamers in their community management for their games to flourish and to increase engagement, buzz, and reach," Newzoo's senior market analyst Jurre Pannekee said. "For brands, partnering with streaming and esports broadcasters has offered them the opportunity to tap into the favorite pastimes of Millennials and Generation Z: watching and playing games. Games provide a rich experience that is always unique to the player. "Gamers and non-gamers are turning to streaming platforms to find new games, follow their favorite streamers, or watch professional esports content. All of these experiences provide opportunities to reach a valuable audience”.